Yes, the contractors are relinquishing a few spaces. Just a few around the edges, but even that is heaven. My handyman, Julien, and his wife Valerie are helping me move things around, set things up, all that. If you have been reading for a long, long time you will remember when I bought the Hangitalls. I like them because I find them to be attractive, practical and a pleasant reminder of my life in Los Angeles. As you can see, I definitely need two. Bit by bit, the house is wrapping up. It’s time to start thinking about the garden. It’s so exciting when you start hanging things instead of fixing things. You’ve got that right. The irony is that this is the cheap and easy part of the project, really the least of it. The expensive part, the NASA-worthy insulation and all, is now completely invisible. Some things are better that way. You appreciate insulation only when you don’t have it. And a roof that is watertight, windows and doors that are airtight, plumbing that doesn’t leak, enough electrical outlets… This house has been a lesson in gratitude, no question. Love the grey walls! 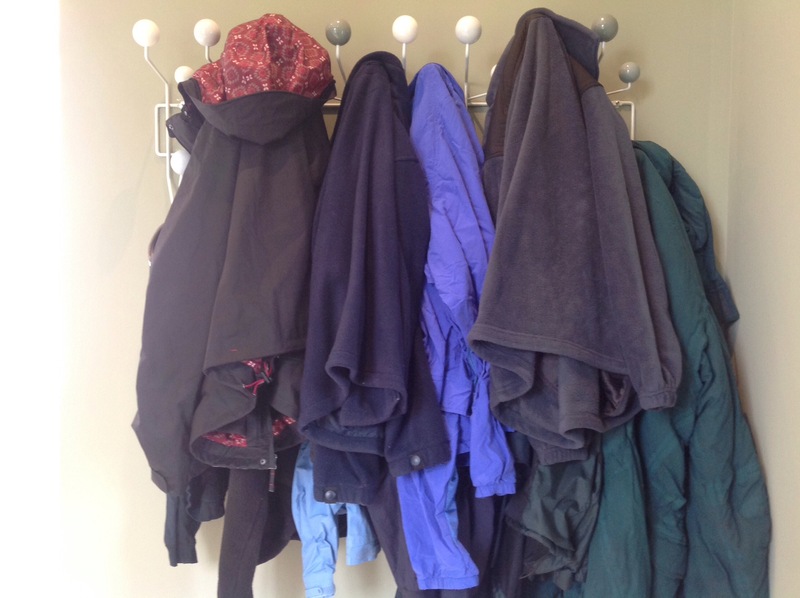 looks like you have nearly as many coats as we have, they make a hallway feel like home! Hopefully though they are now hung up for the summer, not to be touched again until autumn, as you say, time to move outside to the garden. Bon weekend! Oui, bon weekend à vous également. I’m watching Roland Garros with its empty stands and bundled up players and officials. I’m not there, except through the TV. The floods are halfway across the country, fortunately not in your direction. I’m cosy and warm, trying to figure out how I can manage to keep chickens. For the moment, life is good. I love the colour palette on those hooks. Would go well Chez Hovel too..
Yeah, those are good. Purists would buy them in the original “suitable for preschool” bright colors. I have never been a purist. 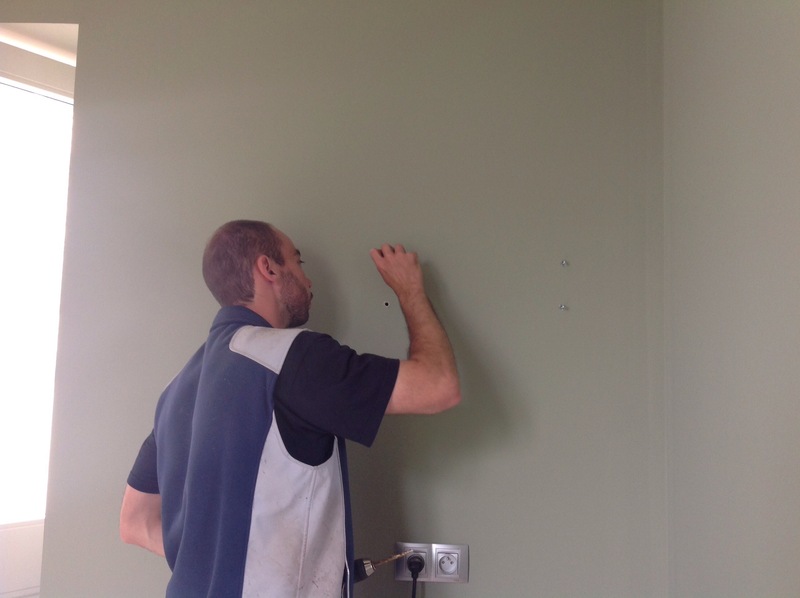 The paint is Little Greene “Pearl Gray.” It has become the color that runs through the whole house, linking all its various bits together. It is great in this soft light. I’m not sure how it would work farther south. Symbols of progress may often be found in the smallest victories! a place to hang your coat and hat, a place to sit, a table for your glass of wine…..
From your lips to the gods’ ears. I can hang my coats. I do have a comfy chair, all cleaned up and positioned to look out over the front garden. It’s 20 years old but it works just fine. But the side table, well, not yet. Soon, soon. How exciting to be ready to finally have your home to yourself and no longer share with lots of contractors. I did not know you lived in Los Angeles. I lived there for 17 years until June 2015. Yeah, I was born in Los Angeles. I had a nice house, small but quite pleasant after the renovations. I forget when I left, exactly, but I just couldn’t take the traffic any more. I certainly do not miss Los Angeles at all, especially not the traffic. This place, this home of yours is taking stunning shape. But tell me more about hangytails … I love them – where can I get them whilst I’m this side of l’atlantique? 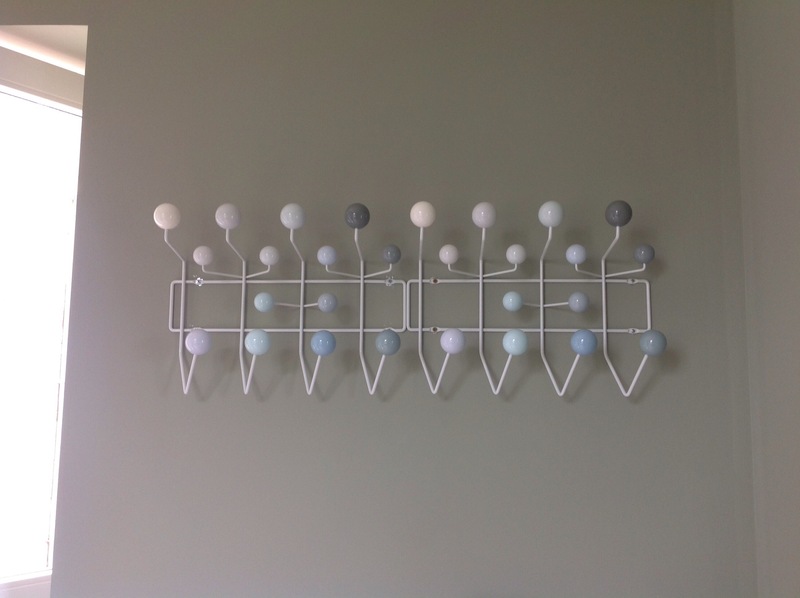 Hangitalls are made by Vitra. I bought mine at Bon Marché. I have seen them at Heal’s and also at a very cool designer housewares shop in Barcelona. Basically anywhere that carries Vitra brand stuff will have them. Maybe my judgement is skewed by the cost of, say, a major heat exchanger system, but I don’t think they were expensive. The originals were designed for small children. The little bulbs that hold hats and jackets are in bright colors. Lately they have revisited the design. The bulbs can come in the grays that I chose or shades of rose pink. Thank you. But empty? Hohoho. In that photo both are nearly full. Since I took that picture I have added half a dozen baseball caps, a couple of those hiking/golf type hats and a couple of jackets. Mind you, except for one for Jacques, all are mine. If I want room for guests I will have to do some serious editing.